Is an iPad holder an ideal investment for my business? Will these countertop kiosks differentiate my company from others? In addition to businesses, can these tablet stands be used by other types of customers as well? Even though these questions only pose a few considerations, the detailed information below can help narrow down alternatives and alleviate indecisiveness during the selection stage. Locking iPad holders, similar to these technology mount systems, provide many extraordinary features on any desk, table, or countertop. Secure iPad holders that are used in indoor settings often serve as mobile work stations in schools, medical facilities and home offices. Each case enclosure enables users to easily recharge Apple products (including iPad Air, iPad mini, and many more) without ever disconnecting the instrument from the fixture. Brands nowadays look to distinct setups in stores to help gain acceptance, create buzz amongst the general public and increase market share considerably. As industries change and head in this direction slowly, tabletop holders for iPad can be used as branding displays which can optimistically form a connection, obtain approval and secure valuable, indispensable relationships with prospects. In order to remain at the forefront, it is essential that corporations become increasingly revolutionary and be willing to do whatever it takes to be an industry leader. 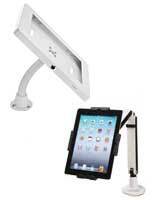 Countertop iPad holders are the solution to help any enterprise do just that. In an affordable, cost-effective manner, Apple apps can be devised for tablet use so as to harmonize with an institution, project core values and interact with a desirable consumer base on an intimate level. This secure Apple case enclosure that can assist in gathering data is a great tool to record information from tradeshow attendees on-location. Many tablets are Wi-Fi compatible and as surveys and phone numbers are entered, they are digitally recorded instantly. This method is a safe solution to assure visiting guests that assessments will not be lost in transit or sold to third-party marketing companies! 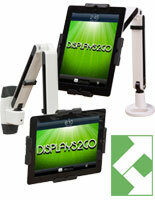 This tablet mount that creates interest and draws attention to any offer exhibited for public viewing. The bright background illuminates digital designed material within each sophisticated case well! Any iPad stand holder that is designed to fit any Apple device can be a great way for cutting-edge restaurants to present detailed menu options to guests waiting or provide an interface for patrons to reserve seating! Many retail stores even use them as an informational kiosk or a register stand. Although these tabletop enclosures are portable, expensive devices are fastened to each and therefore, placement must be within indoor locations! Likewise, operators supervising each setup can modify placement based on traffic patterns, busy store hours and noticeable theft occurrences! 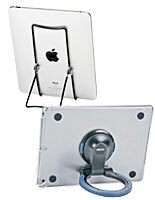 How does a locking iPad holder offered through this online catalog compare to other configurations found on the Internet? Bracket mount adjusts to tightly secure Apple (Air, Mini, Pro, etc.) screens, vertically or horizontally! Felt material affixes to all surfaces on case that come into contact with device! Models offered are engineered for short-term placement! Placement opportunities within businesses, schools and houses are endless! A countertop tablet stand that locks features a swiveling mount which allows any user to rotate the display of the case 360° for public viewing. This unique feature provides a feasible means for versatile handling and proves that this holder is uniquely customizable during each presentation. 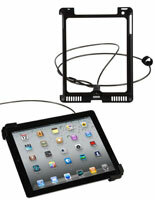 The innovative bracketing mechanism holds an Apple flat panel tablet from opposite corners. As a technological device is secured within the confinements of the desktop mount, users can charge the fixture while in operation. This distinctive competency is not incorporated into other brand configurations and cannot equally compete with these displays If battery life can be continually maintained, banks will constantly promote new banking rates, bars can show drink specials and pictures from highlighted events and bistros are able to offer guests menu options through a digital stand. When applying Apple app innovations, functions are limitless. These desktop stands can also boost productivity in your office. 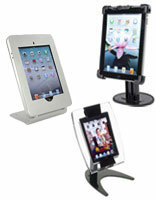 Attach these tablet holders to any table, counter or desk throughout your work area. They can be used to supplement your computer at your personal desk or as an informational kiosk for visitors. 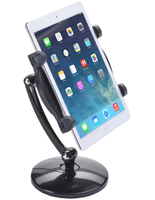 Secure this iPad mount on your conference table to use during meetings and presentations for more interactive collaboration. As interactive exhibitions begin to emerge, kingpin brands have already initiated these tablet mount systems within point-of-purchase retail displays. In time, technology will change the experience within store environments. Why wait and end up behind the trend? All models available can serve as a great solution to engage with customers, break through the clutter and gain awareness of a company in a faster, more efficient manner! Create an application to showcase info with customers on the tablet. Pertinent product facts and testimonials can also be integrated into the application as well. Business firms who have already purchased these stands realize that creativity has never been easier!